At least 4 times per week, I make homemade yam fries. I can’t even begin to tell you how addicting and delicious they are! If you have someone in your life that loves fast food, then give them this recipe, because it will be much healthier and more satisfying then those frozen pre-packaged variety. I’ve ordered yam fries at restaurants before when I feel I want to indulge, and I’m always disappointed. Do you also find they go rubbery once they cool a bit? These won’t! Pre-heat the oven to 400F. Cut the yam in half lengthways and widthways, then cut into 1/4in slices (they should look like wedge fries – but not too thin, because you want to have a soft middle once the outside browns). Toss the yam slices with the oil and salt and pepper, making sure to coat evenly. If the yams look too dry, then add a bit more oil – it’s the oil that helps brown them and make crispy. 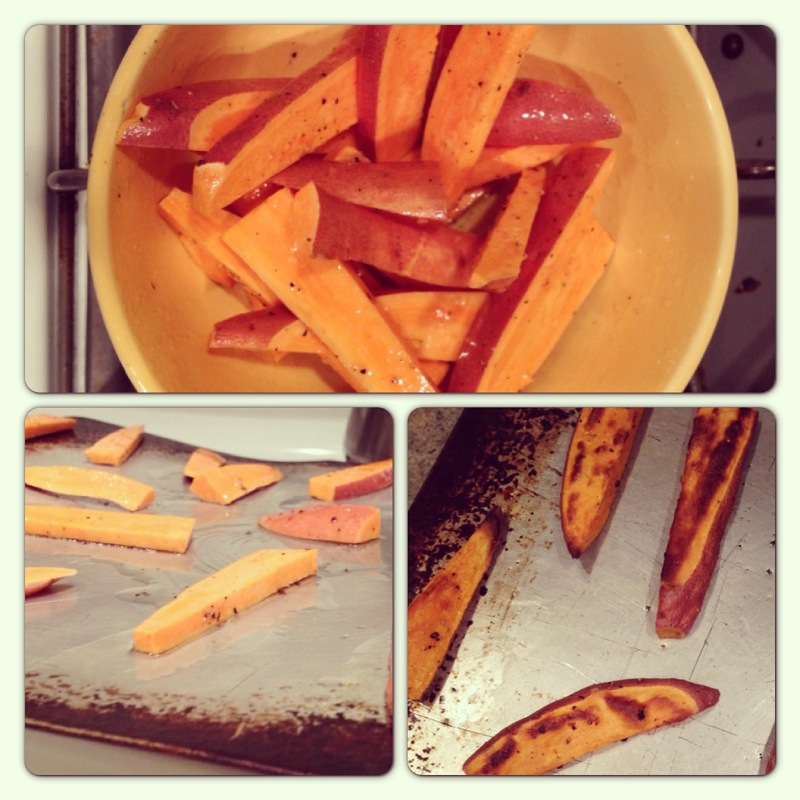 Put the yams out on a pan, making sure to separate each slice evenly across the pan. I know, it sounds a bit finicky, but I think it’s my cooking process that makes them so good! Put them in the oven, checking in at 15min to see how they’re doing. Flip over one slice to see if it’s browning, and if so, flip them all over and put in the oven again for about 5-7minutes, watching carefully to make sure you don’t burn them. I’ve got a gas stove, so it heats up and cooks fast – if after 15min they’re still needing time to brown, wait to flip them and cook for longer, checking frequently. If you want to experiment with flavours, I sometimes add garlic, a couple dashes of chilli powder or cumin to the salt and pepper mix, which I particularly like if they’re going to be going into a salad because it adds some extra flavour. If you can, wait for them to cool a few minutes before biting in – then enjoy! Some people may be interested in trying yam fries but unsure how to properly make them. Thanks for posting this recipe.